I don't really know what is this. 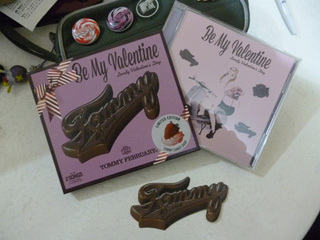 Seems like we can download BE MY VALENTINE. Or maybe it's only for Japan. If you have the right kind of phone, you can scan that barcode for the BE MY VALENTINE ringtone. There is preview of all songs from single on Tommy's official site. Sounds good! The cover even sounds quite fun. Thats interesting. Will have to listen to the whole thing to make my mind up I think. I hiope she has re-recorded the vocals though, as it has always seemed to me that she sings slightly differently for each personna. I don't think that it sounds like the original vocal line, the original sounds softer. Not very fond of the dubstep-ish part right before the fade out though. Yeah, I'm not much of a fan of the cover either. My order shipped today, that really crept up I didn't think it was so close. I like Be My Valentine a lot, the early clip didn't really do it justice as it was just the chorus, but the verses are really strong melodically too. Ai No Ai No Hoshi is really just like a remix to me, it doesn't really have that february6 feel to it. It's tacky, but not the worst thing ever, and I still can't decide if it was re-recorded or not, I'm leaning to 'not' because it sounds so familiar, there doesn't seem to be any tonal difference in the notes she hits at all, a little disappointed in that tbh. Loving the whole single tbh. The only thing I truly don't like is the "dubstep" part on the cover/remix. I hope heavenly6 also does a BuriGuri cover! I'm kinda starting to get annoyed by Tommy only releasing new stuff in special occasions.... Why can't she just realease what she likes when she likes? Do you think Tommy will release BMV PV like monochrome rainbow (after single release and before album)? Or she won't make it? I hope there's a PV. My hopes are for something like, "Be My Valentine" PV is a prequel to a new heavenly6 single, in the likes of "Love is forever"/"Wait till I can dream"
BMV is pretty good; the cover not so much. I wish Tommy would stop putting out new versions of old songs. I would much rather hear something new. I like Be My Valentine a lot! The speaking part is cute. The cover is better than I expected it to be but, I agree with doctorsup, I wish she would make more entirely new songs. Tommy talking during the song it's OK, but the part where that guy is talking is a little bit akward. It's like those voices are invading Tommy songs. The Ai no Ai no Hoshi cover it's nice. For me it's only a way to say "New Brilliant Green songs are coming, please wait a little more". My copy of the single arrived today. I remember her tweeting a pic from the music video shoot? I am not a big fan of this single either. Nor its design. I bought the limited edition, thinking it'd be a digipack cover (like her other lim eds), but it wasn't.. Anyone here with the regular edition? Is that release a digipack or a normal jewel case? "the brilliant green 15 anniversary of debut - tommy february vol 1"
Does this mean there will be more volumes to come? denadel wrote: I am not a big fan of this single either. Nor its design. I bought the limited edition, thinking it'd be a digipack cover (like her other lim eds), but it wasn't.. Anyone here with the regular edition? Is that release a digipack or a normal jewel case? Yes, there will be 6 volumes dedicated to 15th anniversary. Tommy wrote it in twitter. And there is only regular edition. But first press has cardboard case and bonus sticker. So.. single+album from each of her personas + buriguri? Or will she bring forth James Addiction? Let's hope not, the James Addiction has nothing to do with TBG so I sure hope she leaves them out. At the recent event Tommy announced new album. Here is quote from blog of japanese girl, who was there. I don't understand well. Is it new february6's album dedicated to buriguri's 15th anniversary or new buriguri's album that will be released in february?